Some exciting things are happening. Well to me anyway. I bought some new running shoes today! Which means….I’m gettin’ geared up to pound the pavement again. Next race is signed up for April 13th and I can not wait! A new pair of gear always gets me psyched and pumped! I’ve shared my progress to my 1st 5K and contemplated taking it a step further to a 10k. Besides slacking a tad lately (it happens, right? ), I am afraid of the possible damage that could happen to my joints. I hear other athletes who have horrible knee problems from their favorite sport and it breaks my heart. I love the rush and accomplishment I feel when I finish a goal and to conquer an even bigger goal would be even more amazing. So for now, I think I’ll stick to 5K’s and focus on my PR and other cardio fun. Did I just say that in the same sentence….cardio..and uhh..fun? Ya, it’s possible. Does anyone have any other running insights? So being on the topic of healthy, I have a beautiful and super simple pesto for you. I have never made pesto before. Actually, scratch that, I have made pesto…and it was a mess. I made it with strong Thai basil and it made my already non-pesto loving husband not like it even more. So 3 three later…I finally have the courage to make pesto, again, and with teh right ingredients. You have to understand, to a OCD foodie like me, this is a huge…huggeee deal! 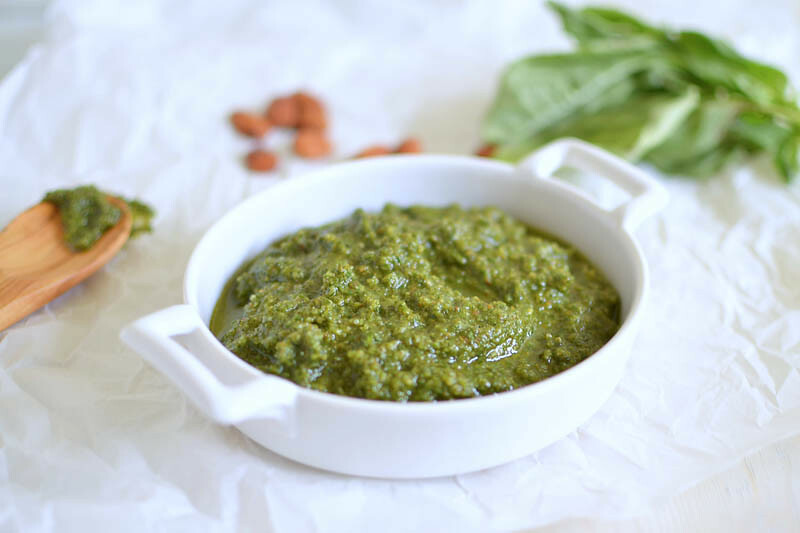 I made this pesto with the ingredients I had on hand: roasted whole almonds, basil, Parmesan, and only 1 clove of garlic, since Mr. Italian is a little sensitive to raw garlic! In a food processor, pulse the whole almonds and 1 garlic clove until all are ground well. Add basil, Parmesan and olive oil and pulse together until well incorporated, but don't over mix. Taste for seasoning. Add additional olive oil if needed. Whenever I look at a recipe I’ve preparted in the past I look for similarities. 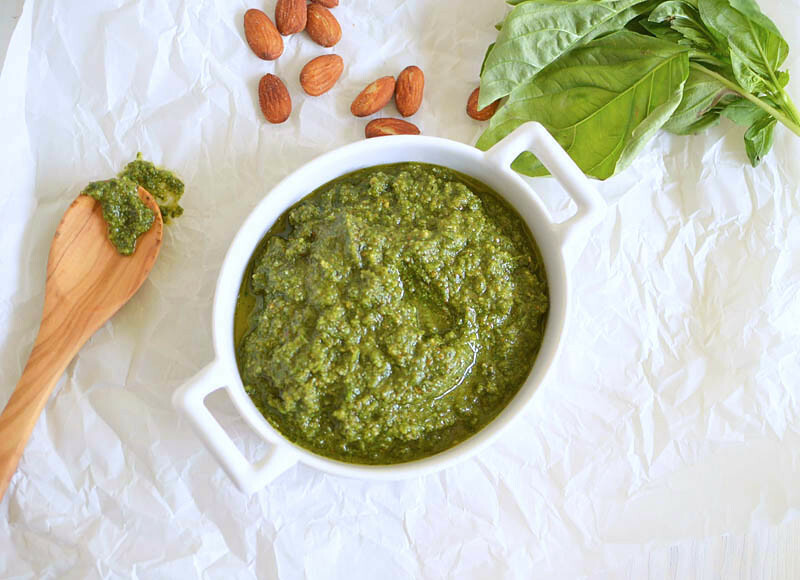 In the case of a basil pesto, I look for the nut ingredient to be sure they’re toasted before they are put in the blender because it gives the pesto a depth of flavor, so I’m happy to see you roasted the almonds beforehand. I agree. Nuts and whole spices are always recommended to be roasted before being blended. I really love that you added almonds to this! I bet it’s delicious. Homemade pesto is such a treat! I wonder if you tried making it with roasted garlic it would be better for your husband?? Can never go wrong with pesto!! So glad the second time around the pesto worked out better! I can see why the Thai basil one didn’t go so well!